We are a re-seller and operator of BreatheHR – the HR software your team will love; intuitive, straightforward, employee-friendly HR software online. The success of your company rests on managing people, not paperwork. BreatheHR is a cloud-based solution focusing on ease of use. It has be developed to free entrepreneurs from their desks, leaving them free to concentrate on leadership and innovation. By focusing on simplicity and ease of use, Breathe is a cloud HR software solution designed to tame the chaos so that you can get out from behind the desk and lead your people. Managing your HR online gives you access to all of your employee documents, staff holiday planner and appraisal management system from wherever you are. 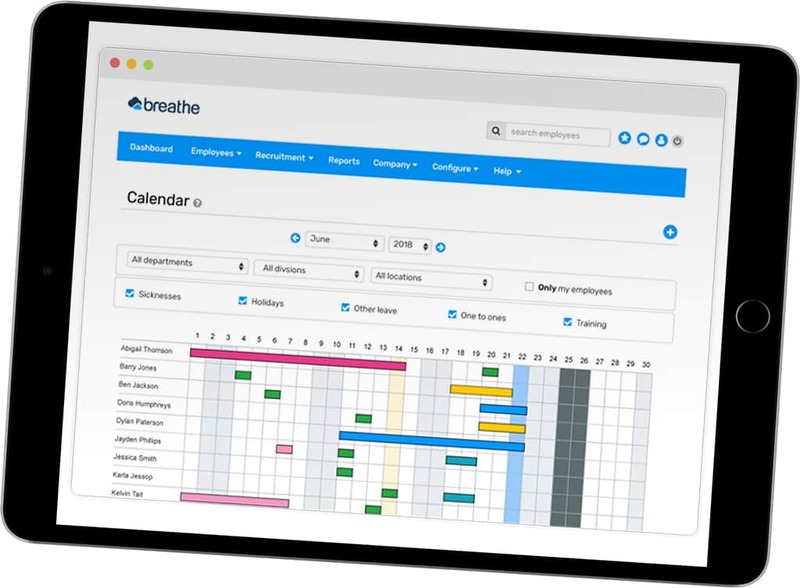 Breathe software offers a flexible, secure and reliable way to manage, advocate for, and communicate with your people. It’s the perfect solution for keeping on top of the day-to-day, and for maximising employee engagement. The user-friendly visibility dashboards, comprehensive analytics and extensive reporting facilities make sure your business is operationally efficient. With a seamless and integrated platform for managing everything related to HR, you’ll find it easy to support a vibrant working community and grow the talent in your business. Breathe software provides the rich data you need to inform your strategic decisions, nip any problems in the bud, and realise every potential. Planning and consistency couldn’t get any better. Keeping all your employee information in one place and automating all those time consuming human resource administrative tasks, Breathetransforms the way you manage your HR. With customisable reports, automated and streamlined processes, this HR management system gives you the tools you need to support your business. Easily generate reports from our report library to spot company trends. Have all your company and employee documents in one central location. Instantly manage, track and approve all the expenses employees claim. With our dashboard, you can see your to-do list, set tasks, and get reminders. Keep using your favourite systems by using breatheHR’s API to help you streamline your information. Manage appraisals, give praise, set one-to-one meetings and objectives. Displaying employee information in a digestable format this will quickly become your go to guide. Allow your employees to manage their own HR tasks with one solution. Know that all your data is stored securely and you have the ability to control who sees what.